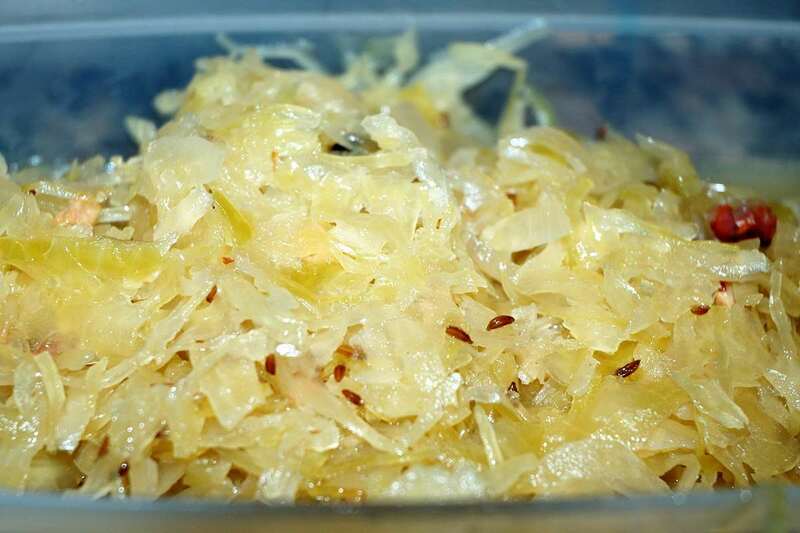 To continue my mini-series on German cooking: This recipe is how my Mom cooks sauerkraut; With butter, bacon, onion, caraway seeds and white wine. It takes about 20 minutes in the pressure cooker and tastes wonderful. Set pressure cooker over medium heat. Add butter and bacon. Cook bacon for 2-3 minutes. Add caraway seeds. Add onions, cook until softened, do not brown. Add sauerkraut (without the liquid from the jars or cans). Stir to coat with the fat. Cook for 2-3 minutes. Add white wine. Put on lid, cook for 15 minutes at high pressure. Adjust heat as necessary. Remove from heat, let stand until de-pressurized. Serve immediately or let cool down, refrigerate and reheat before serving. It's even better when reheated! If the canned sauerkraut is very salty (taste a little sample! ), soak for 2-3 hours in water, change the soaking water every hour.